I was so excited when the Summer PixieDusts arrived. I was surprisingly impressed by the original collection - I say "surprisingly" because I wasn't sure how I would feel about the texture. The first is Destiny. It is described as a red-coral. It's so pretty! This is Beatrix and it is a bright and juicy orange. And this is Solange, a cheerful yellow. The application was so easy and opaque in two coats. It's so hard to capture the beauty of these with a camera. They really do sparkle like glitter! I have found that the PixieDusts come in so handy when I am rushing to get out the door and I want to quickly paint my nails. Not only is the application quick because it's forgiving if you aren't painting them perfectly, but they dry very quickly and you don't have to add a top coat. I also like that if I do happen to smudge my nail, it isn't as noticeable. They also last a long time without any chipping. I had to try them with a top coat; of course, and it makes them appear multi-dimensional. 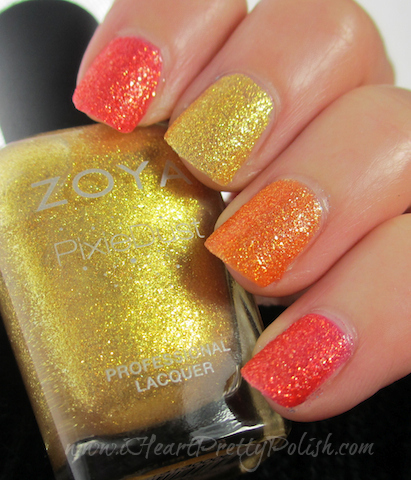 They are sparkly all by themselves, but it adds an extra ooomph when you add the top coat. 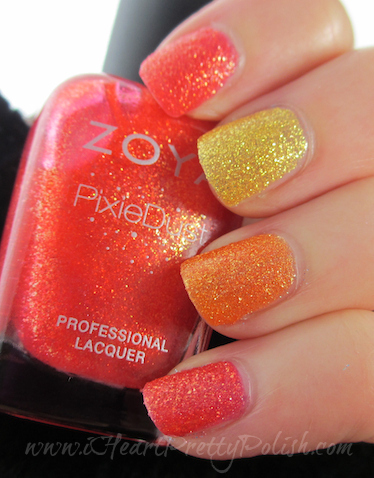 If you are interested in any of the PixieDust polishes, they are all available at this time by clicking here. 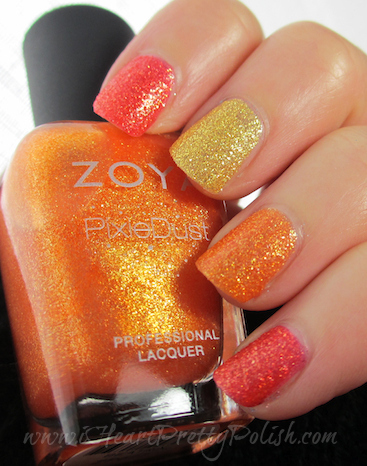 Also, if you haven't never ordered from Zoya, feel free to use my referral link at the bottom of my page. If you are a first time customer and use my link, you will receive a free bottle of polish (I'm not sure if the PixieDusts are included in this special). 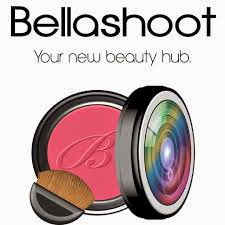 If you add 2 additional polishes, you will receive free shipping on your order. I can't wait to show you the rest of the PixieDusts! They are my favorites and I know you will love them too. Wow! So purty! I suppose most companies will be jumping on the textured polish trend after OPI's Liquid Sands. Destiny looks SO much like one of the new ones from OPI's Bond Girls collection...it also happens to be my most favorite one that the second I saw it, I was like, I MUST HAVE THAT! Haha If you get that one (I believe it's called Jinx? ), I'd say some comparison photos are needed! I'm glad one of us is enjoying these bright, sunny, tropical vacation-type shades on this dismal "spring" day! I'll check it out. I haven't tried any of the Liquid Sands yet. I never thought I would like this textured trend, but I really do! My roommate got a pretty pink Liquid Sands from the Mariah Carey collection - it even has stars in it - SUPER cool!! Your photos are absolutely rockin', you captured these so beautifully! 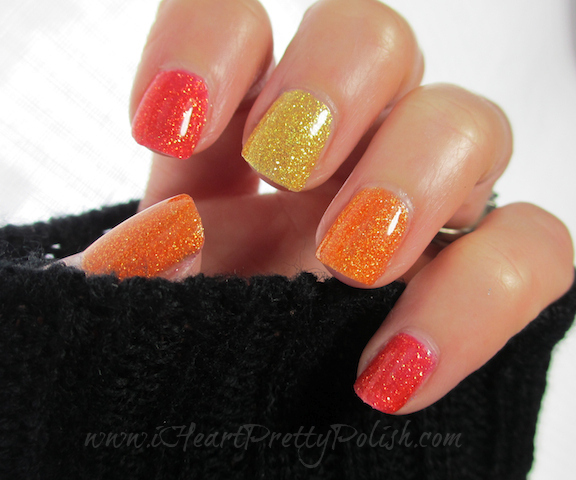 I love your idea for a citrus skittle mani :) These colors are so bright and happy, and I especially like Destiny. oh very pretty! so summery! It sure is summery. Now we need the weather! I love this textured trend! These are absolutely stunning!! I am liking it more and more:) Thanks for stopping by! Our game was postponed until August 19th! I'm sure the weather will be a lot better by then :) I sure hope so!